Usually, the movement of electrons in a real material is rather different from the flow of water in a river. However, in extraordinary materials like the metal oxide palladium cobaltate, PdCoO2, "electron rivers" can exist, as predicted theoretically over fifty years ago and now demonstrated by scientists from the MPI CPfS. Although one might think that when there is an electric current in a metal, the electrons flow like water would in a pipe, that is actually not the case. Their motion is impeded because they bounce off the atoms that make up the metallic crystal, and the flow process is not nearly as interesting as the ones that we can see at play any time we sit next to a river. For electron rivers to exist, one needs to find extraordinary materials in which the collisions with the host atoms are thousands of times weaker than usual. Although this possibility, known as electronic hydrodynamics, was predicted theoretically over fifty years ago, it has taken until now to reach the new regime in a bulk material. In Science Magazine see below; see also the article by J. Zaanen), three papers simultaneously reported experimental success. The groups of Philip Kim at Harvard and Andre Geim at Manchester worked on graphene, but the contribution from the Mackenzie and Moll groups from the Max Planck Institute for Chemical Physics of Solids Dresden was based on an oxide metal. Our material of choice, the palladium cobaltate PdCoO2, has an astonishingly high electrical conductivity, making it possible to look for hydrodynamic effects. To reveal their presence, we sculpted successively narrower channels, and studied how easily the electrons could flow through them. By combining our results with a special theory that is able to model hydrodynamic effects, we were able to show that we had indeed created the long-predicted electron rivers. 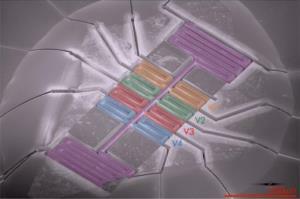 The research opens new frontiers in research into electron behavior in ultra-pure materials. The richness seen in the flow of water might be observable in the flow of electrons, and some of this richness might one day also lead to the invention of new electronic devices. We hope to play a leading role in these developments. The research at the Max Planck Institute for Chemical Physics of Solids (MPI CPfS) in Dresden aims to discover and understand new materials with unusual properties. In close cooperation, chemists and physicists (including chemists working on synthesis, experimentalists and theoreticians) use the most modern tools and methods to examine how the chemical composition and arrangement of atoms, as well as external forces, affect the magnetic, electronic and chemical properties of the compounds. New quantum materials, physical phenomena and materials for energy conversion are the result of this interdisciplinary collaboration. Evidence for hydrodynamic electron flow in PdCoO2.